We Manufacture Different machines for Rigid Box Manufacturing. Rigid Cardboard Box is a very creative industry and it requires highly skilled workforce for making different types of attractive boxes. We help customers to do this high skill jobs with ease and we help them to do it with good quality and good productivity. We have good machines for manufacturing this quality boxes. Our main aim to help Box manufacturers to make boxes in various production capacities from lowest to highest. Our machines helps people to make many types and sizes of boxes with minimum investment in tools. 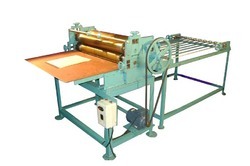 Top Side Gluing Machine is used in Box File Cover Gluing, Diary Cover Making , Case Making etc. This Machine is usefull where speed is more important for carrying out work. With this machine any kind of gluing can be done for paper or card board. Any kind of Cold Glue can be used in this machine. Also We give conveyor length as per customer requirment. Rigid Box Cover Slot Cutting Machine for Gift Box, Shoe Box, Sweet Packing Box, Chocolet Box Manufacturers. This Machine can cut any size of sheet below 24" for box wrapper covers. Slot distance is adjustable and due to this it saves lot of wooden punch die cost as well as space to store this punch. This machine Runs on 1 HP single Phase Motor with Electro Magnet Clutch. Die set Made from Quality steel , Harden and Well Grinded. 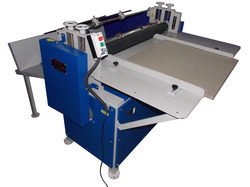 Rigid Card Board Roary Cutting Machine is used for cutting card board into required sizes. Size of Cutting is Easy to adjust. This Machine runs on 2 HP Three Phase Electric Motor and Speed Is control by Panel. 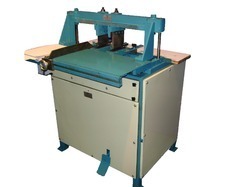 Very useful machine for box makers, diary makers, book binders. Looking for Rigid Cardboard Box Making Machine ?